Today I thought I would bring you another little touch of Spring. I don't know about you but I am needing it. Mother Nature has not cooperated at all. on Monday the rain and the cold came. swimming is out of the question. on this gloomy, chilly and rainy day. This is a very simple little project that takes only a few minutes. The cloche is one I got at a thrift store last fall for $2. I just put some craft store pebbles on the plate first. stuck a couple of faux Spring dogwood twigs in it. Placed that on top of the pebbles. A cute little bit of Spring to get rid of the rainy gloom of the day. a lot of you are now covered in snow again. with all the rain, wind and chilly temps have been forced to indoor fun. I am just hoping that the rain forcast for the weekend doesn't make it here. What are you doing to keep Spring alive in your home? I love your display Cathy! And goodness the weather is also crazy here, one minute it's 80 degrees and the next it's like 40 degrees here in Atlanta. I can't wait until it stays warm! So pretty. 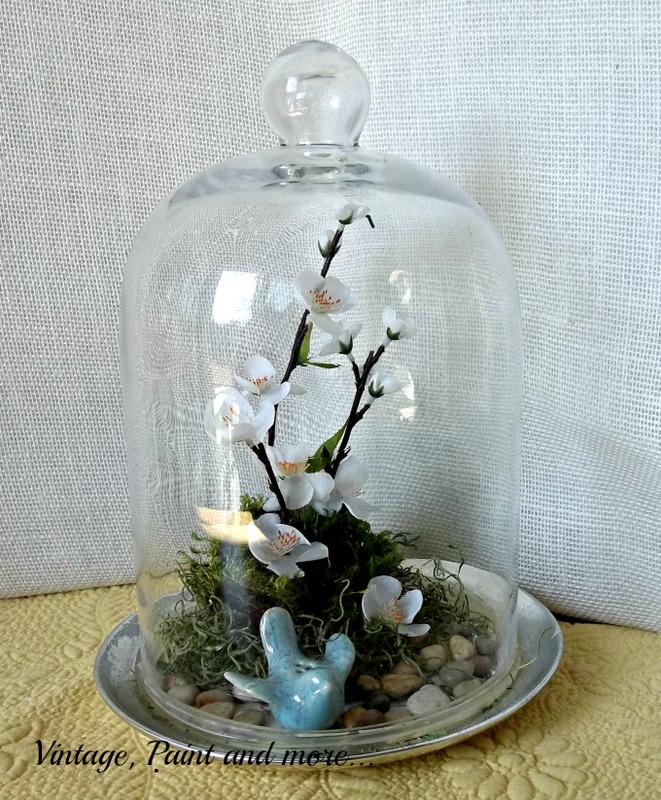 I love cloches, and your display makes me really want to find one! I love this idea, especially changing it up periodically!!! Hope the weather gets better so your kids can enjoy spring break. This is pretty. I specially like that blooming branch. Set-up is so harmony. Oh that's just darling! And I think I need a cute little blue bird! ... Mother Nature sure has been a little out of sorts lately! Beautiful! 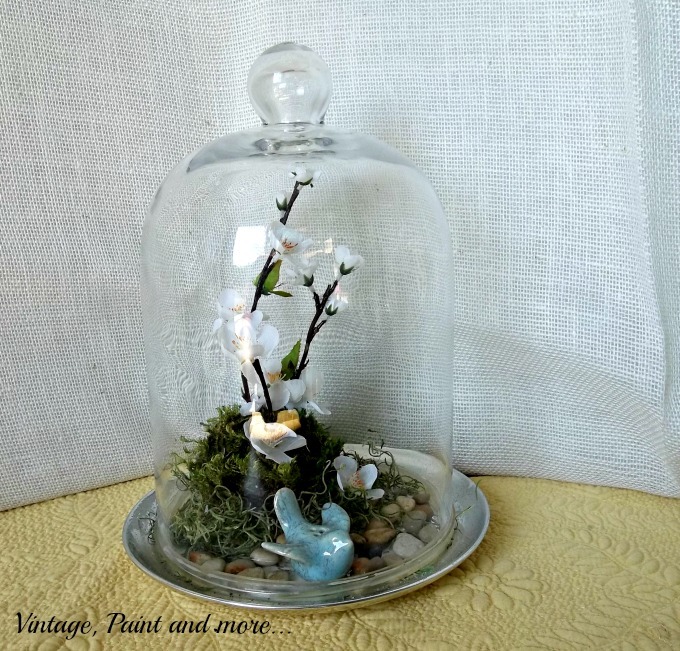 I need a cloche like that. Thanks for sharing at Fridays Unfolded! Cathy,this is such a sweet little vignette. Thanks for sharing and bringing Spring to TTF! Oh, my, how beautiful. I would love to have one of these for my home! Thanks so much for linking up with us over at Tell it To Me Tuesday, we hope to see you linking up with us again next week! A very pretty look! Thanks for sharing. 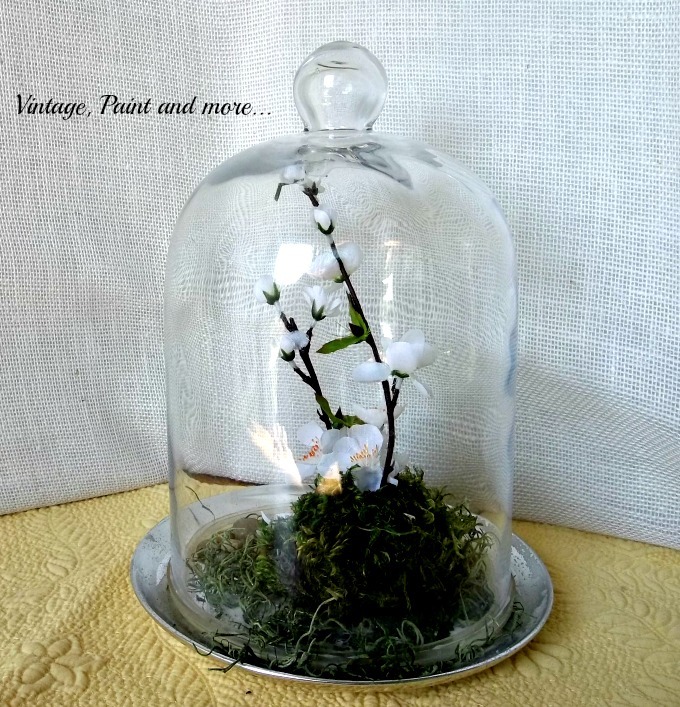 I love cloches and yours is so sweet. Love that little blue bird. What a great bargain you got on the cloche. Thank you for sharing at What We Accomplished Wednesdays. Have a great week! 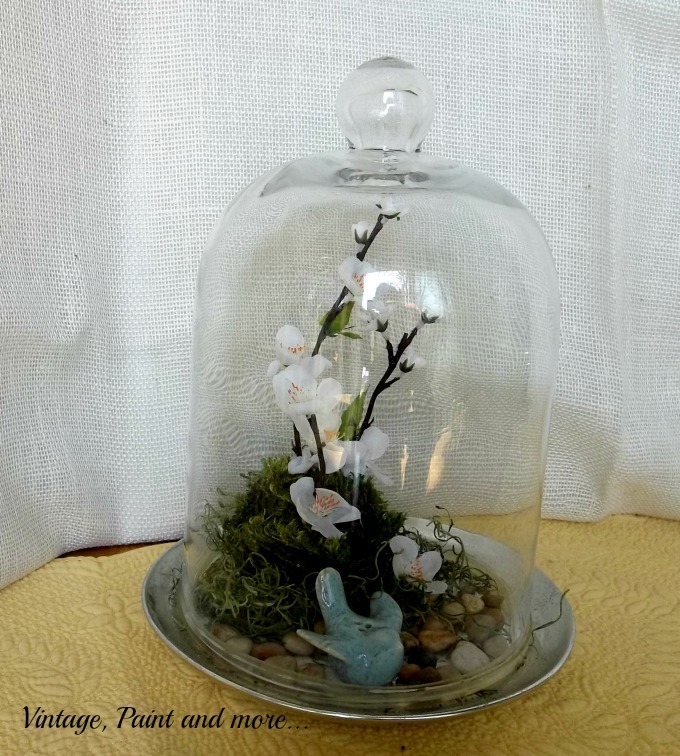 Cathy creating displays in my cloches is my favorite thing to do. Love this touch of Spring! Sprinkling the pebbles was a great idea. Just so happens I have a bag of them on hand. Will have to use them in mine sometime. We had gorgeous weather for a while but yesterday had snow. Suppose to be warm and nice for the rest of the week. Thanks for sharing with SYC.